*I had donated a dozen home baked huckleberries muffins to our National Honor Society raffle. One of the teachers won the muffins, and I told her I would bring them to her this morning. So I woke up and made the muffins. 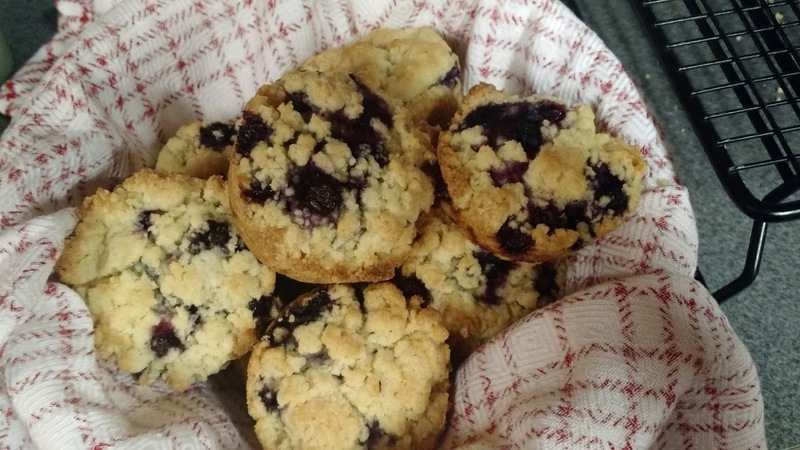 I have made these muffins many, many times, without fail. This morning, I would not have been crowned “Star Baker” by Mary Berry and Paul Hollywood. If this was a technical challenge, I would have been at the bottom. I don’t know what went wrong, but they were all crumbly, and just didn’t look right. So I whipped up a second batch, that turned out just fine, and brought them to Kandace, so she could enjoy her winnings!! But the upside was, there was a dozen muffins for my family to enjoy!! *After a busy day again working with mostly seniors, Zoe and I headed off to Pinehurst Elementary for the PASS program, and some Drama time. There was a small group of students there this afternoon, because these students do not have class on Thursday, so some were already starting their spring break. Zoe and I had fun helping the students perform in the some skits, along with help from Kaitlyn Wohlman, too. Zoe and Kaitlyn graduated from KHS together, and hadn’t seen each other in quite a while. *We arrived home, and finished dinner for Mom. Zoe had put a pork roast in the crock pot, and it was done when we arrived home. I took the roast out and sliced it up. Zoe took the drippings from the crock pot, put them in a pan, reduced them, and poured it over the meat. We cooked up some rice, and headed to Mom’s, where we also put together a green salad. *Arriving back home, Zoe started working on her taxes. The end results were not good. I am going to check things again tomorrow to see if they are as bad as they seem. *I tried to tidy up the house a bit, and do some dishes because Kevin and Linda are coming tomorrow so I thought the least I could do was tidy up a bit. *Then it hit. I turned into a Zombie. After a wonderful, but very busy week of helping students, I had hit a wall. I was done. As I sat washing dishes at the sink, Paul finally made me go to bed. Bed was a welcome and comfortable relief.